— from, "The Long Way Home"
Fifty years. Half a century. What a long, amazing journey it has been so far! This coming weekend, SATURDAY, April 13th, I’ll be gathering with friends and family and our community to celebrate this milestone in my working life. It’s also a CD release celebration of “Singing the News” and “Into the Promise of Morning”. 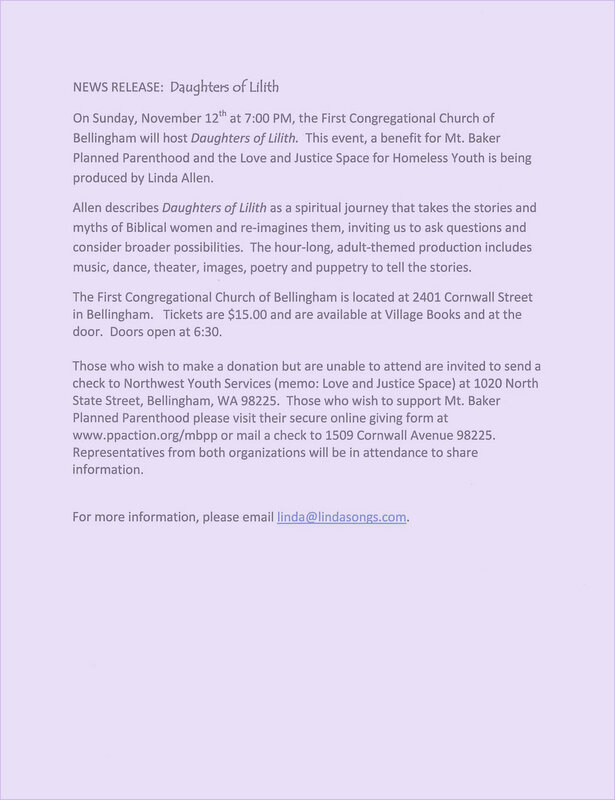 We’ll have a concert as a benefit for the Bellingham Food Bank at 7:00 at Bellingham Unitarian Fellowship. I’ll be joined by my daughters, Jen and Kristin, as well as Janet Stecher and Susan Lewis (Rebel Voices), Phil Heaven, Jeff Wilson, Tom Rawson, Jan Peters, Laura Smith, Kitty King, Marie Eaton, Meryle Korn, Women With Wings, Ellen van der Hoeven, and Scott Slaba. Details are on my website and as a Facebook event. Please share! There’s a great article about Kristin and me and our new recording projects in the latest issue of What Up! Magazine (a Bellingham periodical). April’s edition isn’t online yet, but likely will be in the near future. From this page you can also visit the “scrapbook” link to see some highlights of these fifty years of my working life. So that’s the news. But here’s the thing, and I think I can wrap this up with these last verses of “The Long Way Home”. I wrote this song many years ago, and I still think it is one of the more autobiographical songs I’ve written. It continues to feel deeply true. I could not have had fifty years as a working musician without the support of so many of you.…financially, emotionally, spiritually. This is true of most of us who follow this calling to be artists in this fragile world, so in need of vision, truth and hope. This is a celebration of you, who cared enough to send a kind word, make a contribution, buy a CD or host or attend a concert. You have kept the light burning for us all. Sometimes I wonder whatever made me step out here. Those nights when the moon is dark, and there’s nobody here but fear. ‘Cause it’s a long and a lonely road if you think you’re all alone. Then I think of you, my friends, in my heart and in my bones. Oh, rock me easy, I’m taking the long way home. The above quote appears in an article entitled “Music in the Women’s Suffrage Movement”. On June 15, 1911, the The New York Times published a story about suffragists in Los Angeles who were prohibited from giving illegal “votes for women” speeches, and about the creative way these tough-minded women got around it through music. It is fascinating and I urge you to check it out. It really does confirm what we know about the importance of music in any movement. 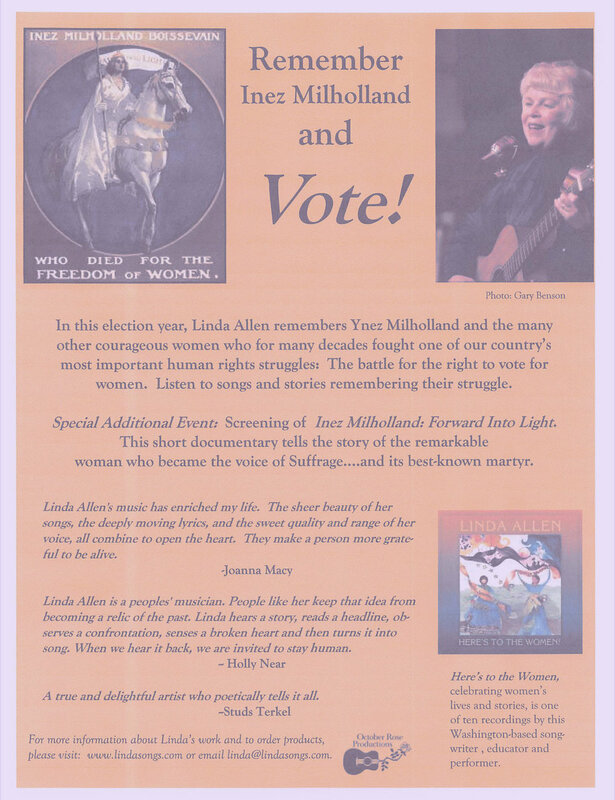 Many of my own political transformations, from the Civil Rights movement to the Vietnam war to the MeToo movement, have come about and been empowered by music. It’s also been my primary tool as I seek to touch hearts and minds through my songs. Music does heal. And music empowers. There’s a lot going on in the next month or so for me. 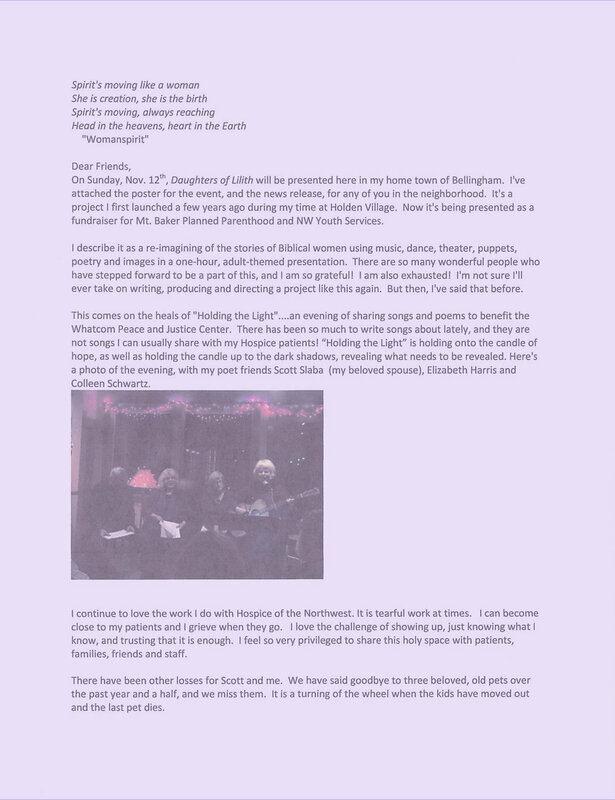 In addition to my regular Skagit Hospice patients each week. . .
Saturday, March 16: “Heartsongs: A ‘Her’storical Perspective”, led by Robin Bailey. I’ll be adding songs to this interactive workshop, at the YWCA in Bellingham. Friday through Sunday, March 22 – 24: “Singtime Frolics”. This is a folk music camp, with lots of singing! I’ll be guest artist, with a mini-concert and two workshops. Registration by March 8th! 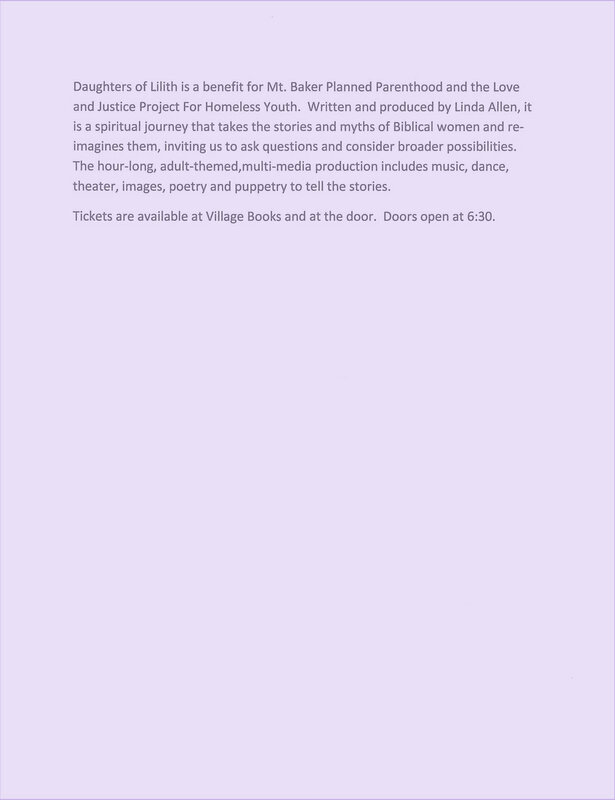 Saturday April 13th, at 7:00 PM: We’ll be doing a fundraiser for the Bellingham Food Bank. An interesting fact I learned today from a person at WECU, is that for every $10 you give to the Food Bank, you provide approximately $100 in food to someone in need. I’ll be talking more about this in my next newsletter, but please mark Saturday, April 13th on your calendar. In addition to being a fundraiser, it’s also benefit/CD Release celebration and commemoration of my half century as a working musician. It’ll be a couple of hours of food, conversation, great music and lots of fun. I hope to see you there. Since launching my new website on Christmas Day, we are constantly infusing it with new information, resources, and timely content! You can now get free, down-loadable, traditional Suffrage songs that were recorded by Kristin and me on the CD, “Failure is Impossible”. For a growing list of songs and resources about Suffrage and women’s history, please check out my “Celebrating Women’s Suffrage” page. Also, I’ve added a collection of beautiful new suffrage cards created by Meneese Wall. These are now available in our store. May you find the song in your heart that needs singing. Failure is Impossible! This has been quite a month, as I completed the second of the two new recordings I had committed myself to produce this year. These were accomplished through the support of so many of you who donated to the GoFundMe site. And now they are done! In the midst of it, when I would hit the wall, I questioned why it seemed so important for me to do this. At 73, I'm not likely to do extensive touring or promotion, as I've needed to do in the past. Frankly, I like leading a rather quiet life as a Hospice musician. The first of the two projects, "Into the Promise of Morning", comes out of that work, with gentle songs of healing. I love being home with Scott and our grand-cat. Our kids are doing fine. But these are unquiet times. And so the second project, "Singing the News", had to emerge out of the cacophony of fear, fake news, and hopelessness that can cripple us into inaction. I needed to write new songs and to bring forward older ones that have taken on new relevance. The idea of doing this came to me a year ago, and would not be denied, no matter how impractical it all seemed. And the time it took! Wow. Fifty-seven days in the studio, at an average of 3 hours a day. I worked with amazing musicians, my faithful engineer Phil Heaven, graphic artist Bob Paltrow, and so many more. And now I am sending it out into the universe, with prayers of hope and a belief that somehow, a song can make a difference. Now I introduce you to visit my new web site. Scott has been working on this for months, learning the skills needed to design a site. And he has done an amazing job! Here you'll find lyrics to 160 songs by the album they’re on, with links to how to purchase a full CD or a song. Songs are also categorized, so if you are looking for songs about the environment, women's issues, family, love and death, whimsy and more, you'll find them listed. 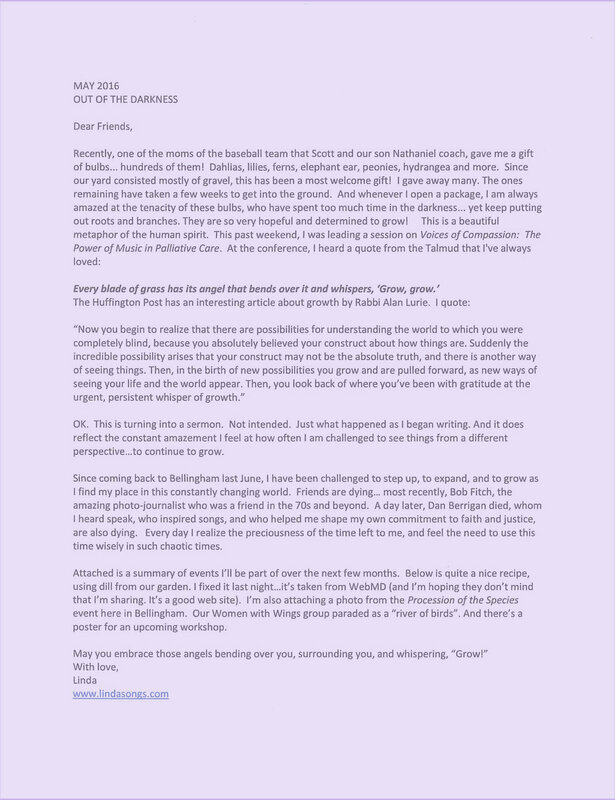 There are special pages for Suffrage and Therapeutic Music, a Scrapbook, Upcoming Events, and a section being developed called Back Pages that will eventually host my "basement tapes", a page for Jen and Kristin, Washington, My Home, and so much more. You'll see here under Upcoming Events that I am heading to San Diego this weekend for a networking conference preparing for the 2020 celebrations of Women's Suffrage. I’ll be presenting my multi-media work called “Here’s to the Women!”. If you are interested in a lot of resources for networking, films, books, plays and more, visit my Suffrage page. Also, please note that March 22 - 24, I'll be the guest artist at a wonderful singing camp near Portland at Singtime Frolics. At this event I'll be offering a mini-concert and two workshops. When you’re there, also note the radio show, Tossed Salad, on Jan. 25th. My friends, may this New Year bring us hope for hard times, and the renewed possibility of a more peaceful world.